This year’s Tops in Trucks Fleet Design Contest winners have taken boldness in fleet graphics to a new level and are well on the road to success. Fleet vehicles remain the main source of advertising for many service companies, and standing out is becoming more and more competitive. 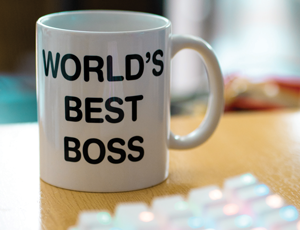 Gone are the days of simply relying on word of mouth — today’s HVACR contractor has to put forth an image that is both professional and memorable. Since we first started our annual Tops in Trucks Fleet Design Contest back in 2007, the submissions have gotten more sophisticated — making our panel of judges’ job more difficult. One thing we always look for in a winning design is the immediate impact it makes upon first glance. Is it bold? Is it memorable? Does it tell you what this company is all about? These are all qualities you want in your rolling billboards, and one way to emphasize those qualities is through the use of color. 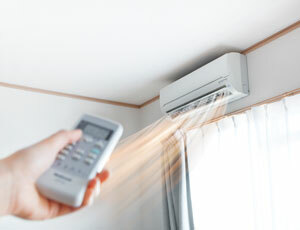 It’s not uncommon for HVACR companies to use variations of red and blue, hot and cold. But to really stand out, you have to rise above and look at color in a new way. Emphasizing one color over another is a great way to be seen and using a different shade of red can be just the thing that separates you from the competition. Located just outside Chicago in the village of Roselle, Ill., Air Max A/C & Heating faces a lot of competition, so it was more important than ever to stand out. 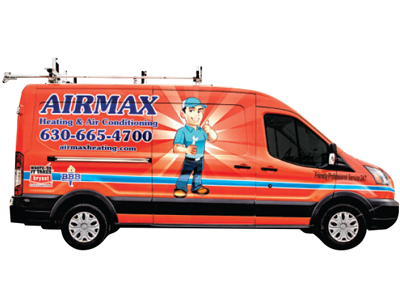 To make sure his company didn’t go unnoticed in the crowded marketplace, Mike Waszak, owner of Air Max A/C & Heating, decided to maximize the use of advertising space on his trucks. He wanted something simple, yet eye-catching. The finished design is bold and bright and definitely stands out. Kalinowski says the use of colors alongside the custom illustration of the technician mascot really makes a statement. “The beams of light emanating off of their mascot also draws the eye in making the van very recognizable,” he says. The design was first implemented last March and so far, Waszak says, they’ve gotten a lot of great feedback from customers. Although Waszak has only wrapped one van so far, he plans to soon wrap the other two vehicles in his fleet. With an initial investment of $10k, Waszak is confident he’ll soon see a tremendous return thanks to the increase in business from Air Max’s high visibility. 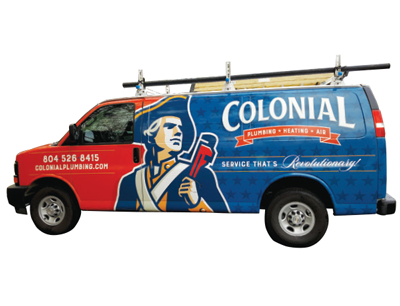 It’s not difficult to figure out where Colonial Plumbing, Heating and Air drew inspiration for the branding on it’s fleet of vehicles. The company is located in central Virginia, which already has a colonial theme to it, in a city called Colonial Heights. So it wasn’t too big of a leap to take when Kester began working with a marketing company to design their new look. The result is a design that is as unique as it is memorable. Kalinowski particularly likes Colonial’s use of bold color, custom illustration and pattern work that makes the fleet immediately recognizable. The red and the blue aren’t the typical shades you see on most HVACR vehicles, and it was a bit of an adjustment for Kester when he first saw the design. 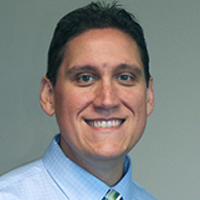 As a smaller company, Kester believed it was time to invest in his fleet — and overall marketing — to compete with the larger companies and national franchises moving into the area. Not only has the investment paid off in additional customers, but also Kester says he regularly gets calls from experienced technicians who want to come work for him now. When Sierra Pacific Home & Comfort began wrapping it’s fleet about four years ago, it was pretty clear what color they were going to use for the new design. Indeed, the big red trucks are immediately recognizable. Kalinowski applauds their ability to be incredibly bold while staying simple. “While Sierra Pacific mainly works in two colors — red and white — the simple design of their seal seems to bounce off the side of their vehicles,” he says. The use of the color red and the slogan became the company’s mantra. 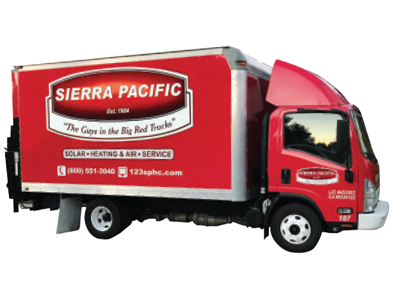 From print ads to direct mail to the vehicle wraps, Sierra Pacific has become known around town as ‘The Guys in the Big Red Trucks’ — and it’s paid off. Sometimes, inspiration comes from an unlikely source. 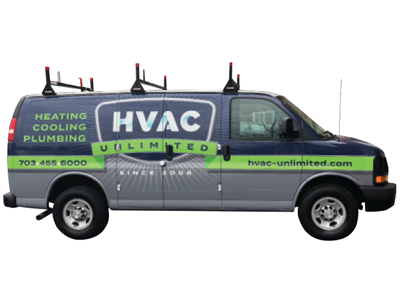 Such was the case for John Cunningham, president of HVAC Unlimited, when he decided to refresh his fleet and his marketing. Sitting at the airport, Cunningham noticed all the Seattle Seahawks gear, particularly the way the bright green popped against the dark blue and gray. He took that back to the designer and the result was HVAC Unlimited’s new look. The other thing Cunningham really wanted from his branding was a timeless look. He felt the best way to do that was through the badge logo. As far as a return on his investment, Cunningham has already seen an uptick thanks to this bold look with the pop of bright green. For a commercial company, vehicle branding is a different ballgame than it is for residential service companies. So, when Nusz decided it was time for a rebrand, he did some research. What they discovered, ultimately led to the look and feel of the company’s finished design. The other major thing Nusz did was drop ‘mechanical’ from Reitmeier Mechanical, simply going by the name Reitmeier, which now lends itself to other divisions he can open up. 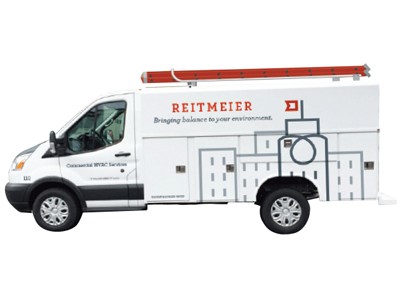 On top of the new design of the wrapped vehicles, Reitmeier invested nearly $750,000 upgrading the fleet itself. So far, fuel usage is down 30 percent and Nusz says they’re experiencing a savings of $20 to $60k annually — not including the soft ROI of increased visibility in their market. 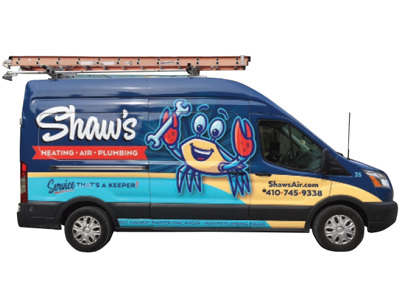 When David Shaw, owner of Shaw’s Heating, Air Conditioning & Plumbing, decided it was time to rebrand his company, he wanted to make sure he embraced the local community in his small town around the Chesapeake Bay. The result is not only a friendly, memorable character logo, but also an overall design that fits in well with the area. From the light blue backdrop representing the sky to the deep blue representing the Bay and the sandy beige stripe symbolizing the shoreline, Shaw’s fleet looks like home. As part of the rebranding launch, the company held a ‘Name the Crab Mascot’ contest and received many submissions from customers. The winner, which took into account Shaw’s longtime company slogan, “That’s a Keeper,” was Keeper. Since Shaw’s first implemented the new design, Shaw has already noticed a few other service companies who have debuted wrapped vehicles, but takes pride in being the first and only HVACR company in the area. 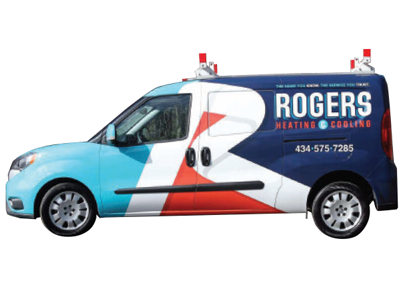 Rogers Heating & Cooling was founded in 1996 and, for nearly 20 years, was run without any kind of branding, relying purely on word of mouth. Then, Joseph Rogers joined his father’s company in 2016 with a vision for growth and to become the leading HVACR contractor in the community. Once Rogers set a plan for growth, they began doing research and found a marketing company to help them design their new look. The marketing firm was in line with that plan and Rogers knew they were a good fit. That’s when they decided to get the ball rolling. The next step for Rogers is a big one — something essential to doing business in this day and age — a company website. Just outside Indianapolis, and a stone’s throw from the famous Indianapolis Motor Speedway, sits the town of Speedway, Ind. 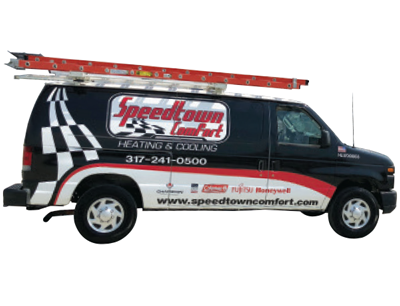 And with close to 36,000 motor sports employees in the area, it’s no secret who Speedtown Comfort Heating and Cooling is targeting. When Wilson started the company with his father, he had a vision for the look he wanted for his trucks. He sketched out his ideas and sent them to a local graphics company, who refined it and came up with the final design. As a small, two-man operation that recently hired it’s third employee, Speedtown Comfort doesn’t have a large marketing budget. What money Wilson does spend on marketing is all focused on the motor sports arena. Wilson also takes great pride when he pulls into the supply house and gets comments from other technicians who say they wish their employers put as much thought and effort into looking professional. As a self-taught graphic designer, Mike Granobles knew he wanted something that stood out and had clear contrast to be able to see all the text clearly on his commercial company’s vans. 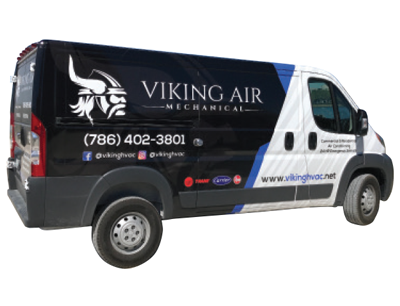 The striking Viking logo against the black van with white and blue accents certainly stands out in Miami, Fla., and it’s paying off for Granobles. An added benefit of the new look, implemented nearly a year ago, is the buy-in from Viking Air Mechanical’s employees. When all is said and done, Granobles is happy with the way it turned out and wouldn’t change a thing.